What better on a miserable dark, rainy day, than to be taken out, for what seems to be the final working lunch of 2018. As Ian and I were heading into the Cotswolds from different directions he suggested we meet at The Corinium Hotel & Restaurant, only a five minute walk from Cirencester’s Market Place but more importantly, it has a large onsite car park, no need for walking in the rain, well one of us has to worry about our hair! I managed to get a few photos of just how cosy, welcoming and Christmassy the bar area looked just before the hotel was inundated with regulars who obviously know a good place for lunch. In the restaurant area there also seemed to be a couple of Christmas parties in full swing but we fortunately bagged one of the few remaining tables by the bar and placed our food orders. Ian chose one of his all time favourite dishes, Lasagne, served with side salad and garlic bread and I opted for a warm goats cheese, beetroot, sweet potato and walnut salad. On arrival the food looked delicious and indeed tasted great. I was interested to learn that Ian had not eaten here before as he seems to have visited most of the restaurants in the area! Judging from the empty plate in front of me I believe he will be back here sometime soon with his wife so they can enjoy not only the great food but also the bar too over a few leisurely hours. 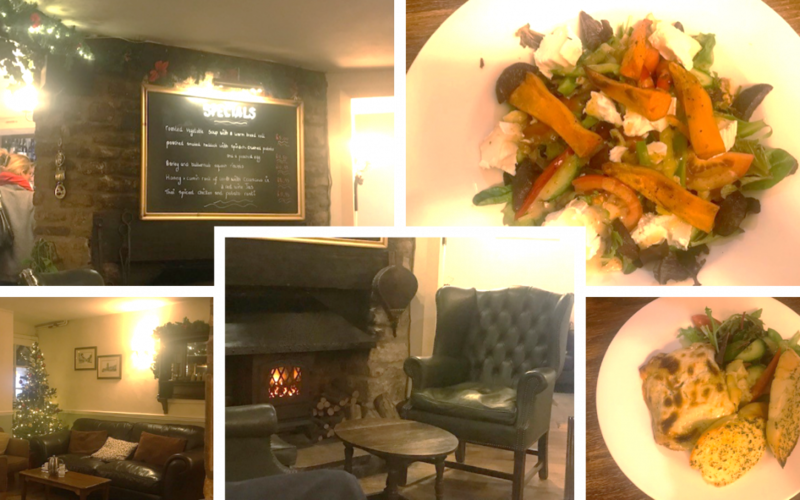 With lunch finished it was time to head back out into the cold when really all I wanted to do was move to the chair next to the roaring fire and perhaps peruse the dessert menu with a large glass of wine!